Brevard NOW has a variety of events, including meetings, social mixers and action opportunities. We invite guest speakers to discuss women’s rights and issues facing women. We also provides updates on our group’s activities and collaborative efforts for the community. At the end of our meetings, we try to leave some time for community announcements. Check out our event calendar for more information. Join Brevard NOW to stop the injustices you see around you. Each member of Brevard NOW has a voice. Make your voice heard by joining NOW today! Membership in a local Florida chapter automatically enrolls you into National NOW (Washington DC) and Florida NOW. In addition to your local chapter newsletters (where applicable), you will also receive National and State NOW publications. When joining, you can select a chapter, or become a member at-large. 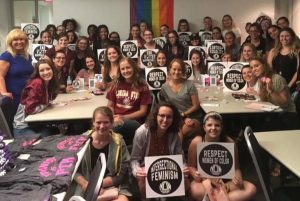 We have numerous volunteer opportunities available for those looking to get involved in feminist activism. E-mail us to find out more. You can donate to Florida NOW.